Explore the destructive power of natural disasters and uncover the science behind the devastation. 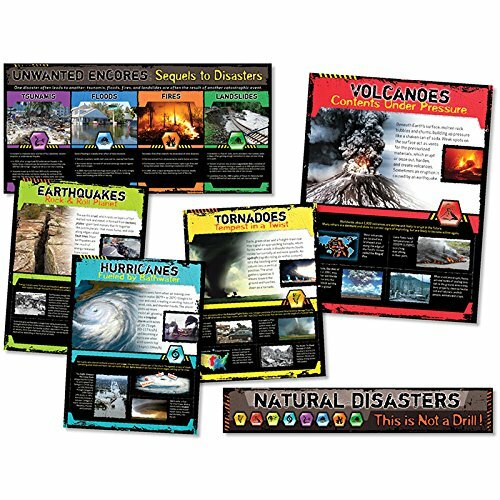 Featuring vivid colors and striking photography, this set examines commonly occurring natural disasters, their impact on human populations and the environment, and historical examples of disasters worldwide. Features a 34" x 51⁄2" (86.4 x 14 cm) banner, five posters—one 34" x 16 1/2" (86.4 x 41.9 cm) and four 17" x 22" (43.2 x 55.9 cm)—and a four-page teacher guide. Includes 6 pieces. If you have any questions about this product by North Star Teacher Resource, contact us by completing and submitting the form below. If you are looking for a specif part number, please include it with your message.